Thunderbolt was involved in several shootouts with police, so the fact that he never killed anyone may have been luck, but it added weight to the belief that Thunderbolt was the Gentleman Bushranger, the last of the professional highwaymen. This reputation was earnt by not harming women, often giving some money back, and shouting for everyone at pubs using stolen money. The illusion of the gallant highwayman suited Thunderbolt as he was regularly assisted by a sympathetic public. Thunderbolt is credited with committing up to 200 crimes. It is surprising that during so many hold-ups not one person was killed, although he shot at police and was once wounded himself. 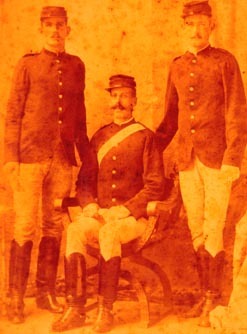 Photograph: Uniformed police of the 1860s.